A yarn over (abbreviated yo) makes an extra stitch on your needle and creates a deliberate little hole in your fabric. Yarn overs are an indispensable part of lace knitting. They have a multitude of other applications, as well, such as decorative increases, buttonholes, and novelty stitch patterns. 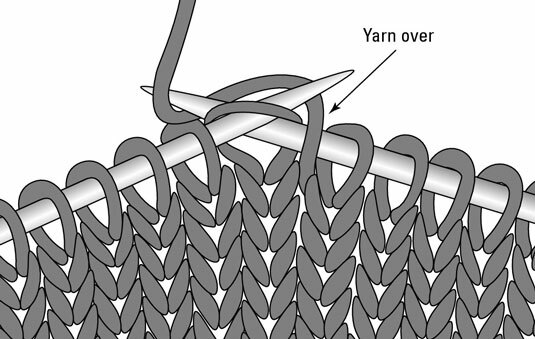 To make a yarn over, you simply bring the knitting yarn (the “over” strand) over the needle between two existing stitches on one row, and then work that strand as a stitch when you work your way back to it in the next row. The working yarn starts in front of the needle. Sometimes it’s already there (if you’ve been purling); sometimes you have to put it there deliberately (if you’ve been knitting). You wrap the yarn around the needle from front to back and work the next stitch as normal. Sometimes, the pattern instructions ask you to wrap the yarn twice — or more times — around the needle to make a bigger hole. While you work the row following the yarn over row, a big hole suddenly appears on your needle where a stitch should be. Above the hole is the strand of yarn that you’ve crossed over the needle. Think of the strand as a stitch and knit or purl it as you normally would. You have 1 extra stitch for every yarn over you do. For example, if you start with 4 stitches and then knit 2, yarn over, knit 2, on the next row you’ll have 5 stitches instead of 4.